TANYERI, U. , DEMIRCI, R.
Its multiplicative nature complicates speckle noise reduction in images because of the effort required for separation of noisy pixels from other pixels. In this study, a novel adaptive anisotropic diffusion filter algorithm based on Haar wavelet transform has been proposed. Initially, Haar transform of image to be filtered was taken and then median absolute deviation of wavelet coefficients was used to tune the conductance parameter, K of diffusion filter with different diffusion functions. The suggested strategy has been tested with different images and different noise variances. Moreover, experimental results have been compared with conventional diffusion filters, and also Lee filter and Wiener filter which are frequently used for despeckling. M. Petrou, C. Petrou, Image Processing: The Fundamentals, 2nd edn. Chichester, U.K.: Wiley, 2010, pp. 325. 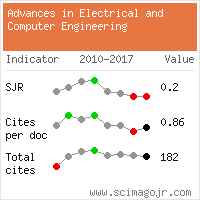 H. Aghababaee, J. Amini, Y. C. Tzeng, "Improving change detection methods of SAR images using fractals," Sci Iranica, vol. 20, no. 1, pp. 15-22, 2013. S. Saravani, R. Shad, M. Ghaemi, "Iterative adaptive Despeckling SAR image using anisotropic diffusion filter and Bayesian estimation denoising in wavelet domain," Multimedia Tools and Applications, vol. 77, no. 23, pp. 31469-31486, 2018. P. Perona, J. Malik, "Scale-space and edge detection using anisotropic diffusion," IEEE Trans. on Pattern Analysis and Machine Intelligence, vol. 12, no. 7, pp. 629-639, 1990. P. Charbonnier, L. Blanc-Feraud, G. Aubert, M. Barlaud, "Two deterministic half-quadratic regularization algorithms for computed imaging," in Proc. of ICIP-94, IEEE International Conference on Image Processing, vol. 2, pp. 168-172, 1994. J. Weickert, "Anisotropic diffusion in image processing," Teubner, Stuttgart, pp. 14-26, 1998. M. Black, G. Sapiro, D. H. Marimont, D. Heeger, "Robust anisotropic diffusion," IEEE Transactions on Image Processing, vol. 7, no. 3, pp. 421-432 , 1998. Y. Yu, S. T. Acton, "Speckle reducing anisotropic diffusion," IEEE Transactions on Image Processing. vol. 11, no. 11, pp. 1260-1270, 2002. S. Aja, C. Alberola, J. Ruiz, "Fuzzy anisotropic diffusion for speckle filtering," Acoustics, Speech, and Signal Processing (ICASSP '01), vol. 2, pp. 1261-1264, 2001. S. Gupta, R. C. Chauhan, S. C. Sexana, "Wavelet-based statistical approach for speckle reduction in medical ultrasound images," Medical and Biological Engineering and Computing, vol. 42, no. 2, pp. 189-192, 2004. F. Maussang, J. Chanussot, S. C. Visan, M. Amate, "Adaptive anisotropic diffusion for speckle filtering in SAS imagery," Oceans 2005 Europe, vol. 1, pp. 305-309, 2005. T. Joel, R. Sivakumar, "An extensive review on despeckling of medical ultrasound images using various transformation techniques," Applied Acoustics, vol. 138, pp. 18-27. 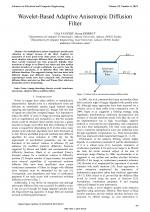 H. K. Rafsanjani, M. H. Sedaaghi, S. Saryazdi, "An adaptive diffusion coefficient selection for image denoising," Digital Signal Processing, vol. 64, pp. 71-82, 2017. S. Aja-FernÃ¡ndez, C. Alberola-LÃ³pez, "On the estimation of the coefficient of variation for anisotropic diffusion speckle filtering," IEEE Trans. on Image Processing, vol. 15, no. 9, pp. 2694-2701, 2006. K. Krissian, C. F. Westin, R. Kikinis, K. G. Vosburgh, "Oriented speckle reducing anisotropic diffusion," IEEE Trans. on Image Processing, vol. 16, no. 5, pp. 1412-1424, 2007. J. J. Nair, V. K. Govindan, "Speckle noise reduction using fourth order complex diffusion based homomorphic filter," In Advances in Computing and Information Technology, vol. 177, pp. 895-903, July 2012. P. M. Shankar, "Use of phase diversity and modiï¬ed phase congruence for edge enhancement in ultrasonic imaging," Signal, Image and Video Processing, vol. 7, no. 2, pp. 317-324, 2013. M. K. Alaoui, T. Nabil, M. Altanji, "On some new non-linear diffusion models for the image filtering. Applicable Analysis," vol. 93, no. 2, pp. 269-280, 2014. R. Demirci, "Fuzzy adaptive anisotropic filter for medical images," Expert Systems, vol. 27, no. 3, pp. 219-229, 2010. G. Singh, M. A. Ansari, "Efficient detection of brain tumor from MRIs using K-means segmentation and normalized histogram," In Information Processing (IICIP), 2016 1st India International Conference on, pp. 1-6, Aug. 2016. A. B. Spanier, N. Caplan, J. Sosna, B. Acar, L. Joskowicz, "A fully automatic end-to-end method for content-based image retrieval of CT scans with similar liver lesion annotations," International journal of computer assisted radiology and surgery, vol. 13, no. 1, pp. 165-174, 2018. P. Mercorelli, A. Frick, "Noise level estimation using haar wavelet packet trees for sensor robust outlier detection," In Computational Science and Its Applications-ICCSA, pp. 847-856, 2006. S. Finn, M. Glavin, E. Jones, "Echocardiographic speckle reduction comparison," IEEE Trans. on Ultrasonics, Ferroelectrics and Frequency Control, vol. 58, no. 1, pp. 82-101, 2011. R. Demirci, U. Tanyeri, "Anisotropic diffusion filter using Haar wavelet," In System Theory, Control and Computing (ICSTCC), pp. 1-6, Oct. 2012. D. L. Donoho, I. M. Johnstone, "Ideal spatial adaptation via wavelet shrinkage," Biometrika. vol. 81, no. 3, pp. 425-455, 1994. G. Chang, B. Yu, M. Vetterli, "Adaptive wavelet thresholding for image denoising and compression," IEEE Trans. on Image Processing, vol. 9, no. 7, pp. 1352-1545, 2000. D. L. Donoho, "De-noising by soft-thresholding," IEEE Trans. on Inform. Theor., vol. 41, no. 3, pp. 613-627, 1995. G. Andria, F. Attivissimo, A. M. Lanzolla, M. A. Savino, "Suitable threshold for speckle reduction in ultrasound images," IEEE Trans. on Instrumentation and Measurement, vol. 62, no. 8, pp. 2270-2279, 2013. L. L. Huang, L. Xiao, Z. H. Wei, "Multiplicative noise removal via a novel variational model," EURASIP Journal on Image and Video Processing, vol. 2010, 2010. J. Sun, Z. Xu, "Scale selection for anisotropic diffusion filter by Markov random field model," Pattern Recognition, vol. 43, no. 8, pp. 2630-2645, 2010. Z. Wang, A. C. Bovik, H. R. Sheikh, E. P. Simoncelli, "Image quality assessment: from error visibility to structural similarity," IEEE Trans. on Image Processing, vol. 13, no. 4, pp. 600-612, 2004. J. Lee, "Speckle analysis and smoothing of synthetic aperture radar images," Computer Graphics and Image Processing, vol. 17, pp. 24-32, 1981. S. Solbo, T. Eltoft, "A stationary wavelet-domain wiener filter for correlated speckle," IEEE Trans. on Geoscience and Remote Sensing, vol. 46, no. 4, pp. 1219-1230, 2008. A. Ozcan, A. Bilenca, A. E. Desjardins, B. E. Bouma, G. J. Tearney, "Speckle reduction in optical coherence tomography images using digital filtering," Journal of the Optical Society of America A. vol. 24, no. 7, pp. 1901-1910, 2007. Citations for references updated on 2019-04-23 08:49 in 219 seconds.